Rogers Communications' iPhone Coup: Not All It's Cracked Up to Be? Apple to Introduce Handwriting Recognition with iPhone 2.0? "According to reports, AT&T is preparing to subsidize $200 of the cost of Apple's new iPhone. If this is true, watch out. The Apple market share story just entered a new realm of mad growth. "Remember what happened when Nike hooked up with Michael Jordan? The $199 3G iPhone is Apple's MJ. The world is about to change. By Christmastime, if you're not ichatting, igaming, or ipoding on your mobile device you will be severely outdated. It is rumored that the new applications will allow the iPhone to access your home computer and your home television. This technology will allow users to stream any movie, television show, or song directly to your phone over the 3G network." "But nobody's talking about what the iPhone needs most of all: It needs to be a better phone. The iPhone's fair-to-poor phone-call quality is a well-known problem among phone reviewers. I've been comparing phones side by side for four years, and the iPhone falls short on signal strength, speaker volume, and call audio quality, especially when held up against the latest BlackBerrys or anything on the Motorola RAZR2 platform. You know you have a real problem when Engadget is suggesting that you stab your speakerphone with needles to get rid of the muffle." "I'll be honest: I use the cassette deck in my car way more than I use my CD player. In fact, I hardly ever use the CD player, and use the cassette deck every day. "And no, it's not because I have a bunch of cassettes with old-person music that geezers like Chris Breen probably listen to. Nor is it because I'm one of those 'post-modern' analog-loving hipsters who make mix tapes Old Skool style to demonstrate their chic non-conformist approach to the our 'evil' consumerist culture. "I actually just use the cassette deck because I have one of those nifty cassette adapters that let you play your iPod music through your car speakers. And these days, most people I know play more iPod music in their cars then they do CDs...."
"This article focuses on Apple's iPod business. The iPod has contributed significantly to Apple's growth the past several years. However, iPod unit growth has been slowing, as nothing can grow forever. 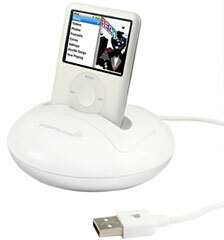 Apple has made some modifications to its iPod line which should help boost iPod demand. Apple announces Q2 results April 23rd, and unit sales growth as well as iPod ASP will be areas of focus. "Deceleration of iPod's sales growth is pointing to a market approaching saturation...."
"Whenever an analyst wants to write something without thinking, it's easy to pontificate on such silliness as the alleged resemblance of the iPod to the Sony Walkman. Both gained iconic status, but the latter was eventually largely supplanted by me-too products that were cheaper and offered identical or additional features." "We didn't realise it, but an MP3 player can kill you. According to Australian police, that is, who have launched a series of hard-hitting posters designed to stop people crossing roads while changing tracks." "If you're an Apple fan who has been waiting for the iPhone - or at least an 'official' version of the iPhone - for lo, these many months, your heart probably leaped at the word from Rogers Communications (RCI) supremo Ted Rogers this morning that he has signed a deal with Apple to launch a maple-flavoured version of the world's most sought-after handset. If you have ever had a cellular data plan from Rogers, however, your heart probably leaped a little less high, and may even have let out a small sigh or shrugged its heart-shaped shoulders. "Why? Because as more than one person has pointed out, the fact that the iPhone is coming to Canada isn't really the important thing. It's important, of course, but everyone knew that it was going to arrive eventually. The *really* important thing is what it's going to cost when it finally arrives - and not so much the phone itself, but the data plan. Will the word 'unlimited' be used in conjunction with the word 'data?' And if it is, will it actually mean 'unlimited,' or will it mean something else that only appears in that special Rogers' dictionary?" Link: Rogers Communications' iPhone Coup: Not All It's Cracked Up to Be? "A new Apple rumor is making the rounds on the Internet: The company could be working on the rebirth of the Newton handheld, possibly in the shape of an ultra mobile PC. Why? Handwriting recognition capabilities for the simple Chinese character set have been discovered within the iPhone 2.0 SDK firmware files. Handwriting recognition may be a generally nice feature for the iPhone, but the idea of a new Newton is certainly worth talking about. "It seems that Apple's upcoming iPhone 2.0 software update will spoil the party for Chinese developer Hanwang Technology, which still hopes to be be able to offer the first handwriting recognition software for the iPhone...."
Link: Apple to Introduce Handwriting Recognition with iPhone 2.0? PR: Kensington Computer Products Group, a worldwide leader in delivering smart made simple™ computing accessories to the mobile consumer, announced the release of its Battery Pack and Charger for iPhone and iPod that also comes in an ultra small and lightweight portable version - the Mini Battery Pack and Charger for iPhone and iPod. These new offerings are especially convenient because they simultaneously power and charge an iPhone or iPod, and they are rechargeable, as well. Kensington's smart made simple design approach gives consumers a combination of two portable sizes to best accommodate their mobile lifestyles; the standard model is the perfect traveling companion for heavy duty power needs while the "mini" is designed for users to easily carry with them on a daily basis. This means that finally - even the most avid consumers can make the most of their devices, knowing that they always have a ready supply of power at hand to keep the conversations going and the music playing. Today's mobile professionals want to take nonstop advantage of the rich variety of iPhone and iPod capabilities without having to worry about running out of battery life. Now they can always have a fresh charge at hand in a size that tucks into airplane carry-on's or a slim "mini" that slides into a jacket pocket or the smallest women's evening bag; or can even be left connected to your iPhone or iPod. Recharging is straightforward and easily implemented with a simple USB dock connector. Both products are available online at Amazon.com and Kensington.com and will be available at major retailers at the end of the month. PR: Charging your iPod has never been more simple. Proporta's Universal iPod Dock allows you to mount your iPod or iPhone - whatever member of the iPod family you may own, by providing a selection of insert trays to suit. Not only that, the iPod dock can also be used with your charging cable enabling you to power your iPod or iPhone whilst it sits merrily in the dock. 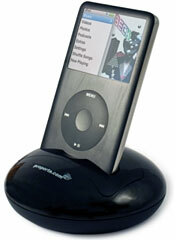 The Proporta Universal iPod Dock comes with five insert trays to best fit your Apple iPod classic 80 GB, Apple iPod classic 160 GB, Apple 3G iPod nano, Apple iPod touch and Apple iPhone, and is available in both black and white so that you can best match it to the colour of your iPod or iPhone. PR: ivyskin announces XyloT2 Special Edition cases for iPhones and iPods. Now available, the finest in sleek durable protection, ultra slim XyloT2 special edition Modena Yellow, Raz Red, Royal Blue, and Jet Black. Made of hard-shell plastic and features a minimal wall thickness, full touch-thru acrylic screen and Xylo Surface scratch protector. ivyskin announces XyloT2 Special Edition cases for iPhones and iPods. Now available, the finest in sleek durable protection, ultra slim XyloT2 special edition Modena Yellow, Raz Red, Royal Blue and Jet Black. Made of hard-shell plastic and features a minimal wall thickness, full touch-thru acrylic screen and Xylo Surface scratch protector. Full Acrylic frontal protection provide Touch Through access in addition to impact and scratch protection and the Xylo surface protection layer, provides a full scratch proof case. The Yellow, Blue, Red, and Black high gloss, hard protective coating provides added scratch resistance and color depth all in metallic paint. Xylo is a scratch resistant liquid plastic coating that is applied as a final step in ivyskin's proprietary coatings process. The Xylo coating is applied to each of our product in a custom atmospheric chamber in its liquid form, and then cured with ultra violet light to achieve superior scratch resistance and clarity. XyloT2 Special Edition cases are only $34.99 each and may be purchased from their online store. PR: iLounge, a leading resource of iPod + iPhone information has officially launched the Design The Next iPhone, Win The Next iPhone Contest. Think you've got what it takes to design the next iPhone? How can you win? Design the Next iPhone! We will be looking for six total winners for this contest - three grand prize winners will receive Apple's next-generation iPhone, courtesy of iLounge, and three runners up will receive $100 iTunes Gift Cards. iLounge, a leading resource of iPod + iPhone information has officially launched the Design The Next iPhone, Win The Next iPhone Contest. How can you win? Design the Next iPhone! PR: Readdle, a leading provider of the book and document reader services for the iPhone and iPod Touch, announces its plans to release a native iPhone application for storing and reading office documents and eBooks on the iPhone and iPod Touch. Readdle is a web-based application that allows transferring, organizing and viewing documents on the iPhone and iPod Touch. Readdle, a leading provider of the book and document reader services for the iPhone and iPod Touch, announces its plans to release a native iPhone application for storing and reading office documents and eBooks on the iPhone and iPod Touch. Readdle is a web-based application that allows transferring, organizing and viewing documents on the iPhone and iPod Touch. The upcoming iPhone application will extend service functionality, ensuring seamless storage of files on the device and viewing them with no live Internet connection. The document viewing functionality will feature page-by-page reading, adding bookmarks to the text, iPhone optimized PDF rendering and other options. Readdle is web-based book and document reader optimized for using on iPhone and iPod Touch. The service supports PDF, TXT, HTML and PDB(Plucker) files as well as MS Word and MS Excel documents, and provides 50 MB free space for book upload per account. More space and additional features available for a small fee. Information about the Readdle could be found at their website.